“My Little Pony: Friendship is Magic”, I can only recommend watching it (in contrast to “Matrix Revolutions”). At least if you’re not a 16 year old male teenager who has to prove his manliness to the world at any given moment. You can watch the entire series on MenloMarseilles’ YouTube channel. The first two episodes are a bit too corny for my taste, but the character design is really done well and the facial expressions are pure gold. 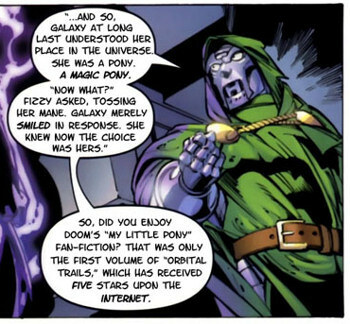 However, the characters often talk fast and have American accents, so non-native speakers may need the transcripts of the episodes posted on the My Little Pony Wiki. Another source of information about the show is the Equestria Daily blog. I’m sure nobody believed a cartoon series based on a toyline for little girls could be entertaining at all. Kudos to Lauren Faust and her team for making the impossible highly unlikely happen. Also the fact that this show is watched by wider target audience, thanks to internet exposures and that website we shall not named. This series reminds me of the classic Cartoon Network show back in the 90s, much more better than Cartoon Network nowadays. hehe, i’ll admit, even as a 19 year old male college student, bored with modern cartoons that don’t hold a candle to the real deal like loony tunes and the animaniacs, finding something as original and pleasantly funny as this while channel surfing was a miracle at best. If it wasn’t for the fact that watching this show regularly would lower my masculinity to a dangerous level, I’d watch it regularly. My favorite character is twilight (the purple one) she’s supposed to be the smart, angsty, sensible one that brings most of the other whimsical nutjobs down to earth. (Though, in the end, she can’t help but be caught up in the lunacy as well.) Classic. That was pretty entertaining, but I would be ashamed to watch it with company. I don’t have to prove I’m secure in my masculinity by taking part in things that aren’t considered masculine :P.
This show is rocking the Internet like a hurricane at the moment. And I say: FOR A DAMN GOOD REASON. Good eye. Lauren Faust, who took the lead on “My Little Pony” worked for cartoon network and is married to Powerpuff Girl creator, Craig McCracken. This cartoon is so cute. I wish the pony cartoons from my childhood were as well-done as this one. The episodes always bring a wide grin to my face, but… can you guarantee this is not a trick to lead us to certain doom? Ohh god not this again, look, the show is good and all but the fans of it are what I have a problem with. Some ( but not all ) take it to an extreme to annoy the hell out of others with their persistance, as Ack already knows. I hope I’m not offending anyone here. I like it, AND I fall in to the demographic that you mentioned! Take that! Personally the way that i avoided the whole “loseing masculinity” thing while watching… Basically anything that would cause such things (My Little Pony is really only one of these shows) is i get my 6 yr old neice hooked on them…. That way, it’s not that *i’m* watching the show, it’s that *she’s* watching the show and i’m just being a good uncle and spending time with her. I hope I’m not offending anyone here. Actually, I’m not surprised that many of us enjoy this series. Personally, I think this series have something I always look for: a good story and a good drawing in a good combo. This is one of the cutest series at the moment. Starlight Sparkle Has to be my farerite followed by Pinkie Puff who’s randomness makes her that much Cuter. Quote? If you mean the Maretrix… that doesn’t exist. The one quote I’m aware of is in this song in episode 14. Starlight Sparkle Has to be my favorite followed by Pinkie Pie who’s randomness makes her that much Cuter. MenloMarseilles’ account got hit a while back by what was almost certainly one or more trolls impersonating Hasbro. Other’s have taken up the torch…going to You Tube and running a search for “Friendship is Magic Episode” should get one pointed in the correct direction.